A molecularly imprinted polymer with trinitrotoluene as the template molecule was synthesized and used as the novel coating for solid-phase microextraction of the nitroaromatic explosive 2,4,6-trinitrotoluene for its selective determination. The fiber was characterized in terms of coating thickness, morphology, intra- and inter-batch repeatability and extraction efficiency. An average thickness of 50 ± 4 μm with a uniform distribution of the coating was obtained. Good performances of the developed procedure in term of both intra-batch and inter-batch repeatability with relative standard deviations <8% were obtained. Finally, detection and quantitation limits in the low nanogram per kilogram levels were achieved proving the superior extraction capability of the developed coating, obtaining gas chromatography-mass spectrometry responses about two times higher than those achieved using commercial devices. 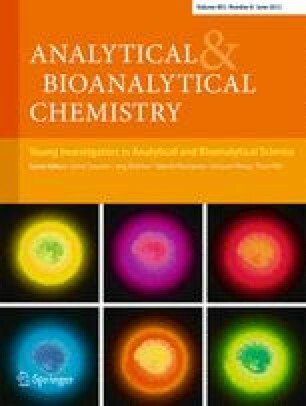 Published in the special issue Young Investigators in Analytical and Bioanalytical Science with guest editors S. Daunert, J. Bettmer, T. Hasegawa, Q. Wang, and Y. Wei.